We’ve had this computer armoire for over ten years, we bought it when we were first married and it used to sit in the corner of our family room and hold our huge 300 CD stereo equipment and speakers, remember those days before the iPod? A few years ago we got rid of the stereo equipment we weren’t using and started to use the armoire for its intended purpose – as a computer station. It’s a fantastic piece I scored on sale at Macy’s furniture store years ago, but sitting in front of it felt like staring into a cave, it was dull, dark, and unorganized. This year, I’m determined to be as organized as possible when it comes to all the activities, from school to extracurricular sports and lessons. I thought it best to keep it all housed in one place, so the computer armoire has now become family organization central. Goodbye dark and dreary interior. It all began last week in my frenzy to prepare for back to school. I started with my favorite primer and a disposable kit which makes working with oil based products easy. I spilled some all over my hands wiping up the gallon, but no worries. I discovered years ago the easiest way to get it off is not with mineral spirits or paint thinner but with regular ol’ kitchen cooking oil and dishwashing soap. 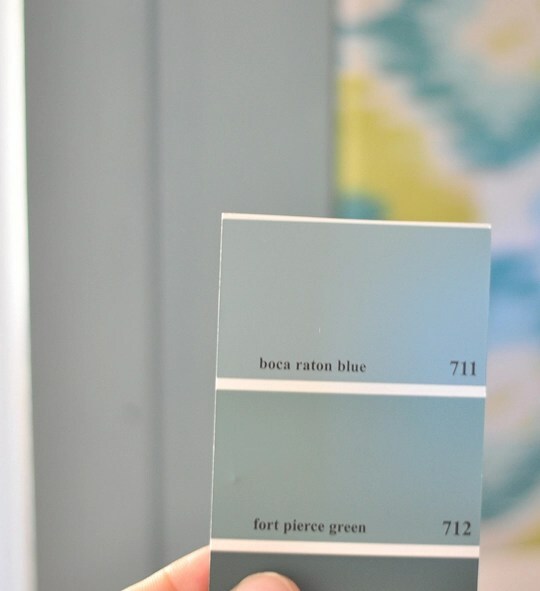 I didn’t buy any new paint for this project, I have so much extra blue and gray latex paint that I mixed up the interior color myself from three different leftover paints, but after it dried I color matched it – the closest is ‘Boca Raton Blue’ by Benjamin Moore. Inside the blue interior is a new pale gray monitor (practically impossible to find white for a PC, don’t get me started) a lamp, and other colorful office supplies. Don’t worry about the heat from the lamp housed inside, it’s a 25 watt bulb and I’ll likely replace it with a task lamp soon. It’s so kid friendly now which is great since the kids have homework and testing to complete on the computer. 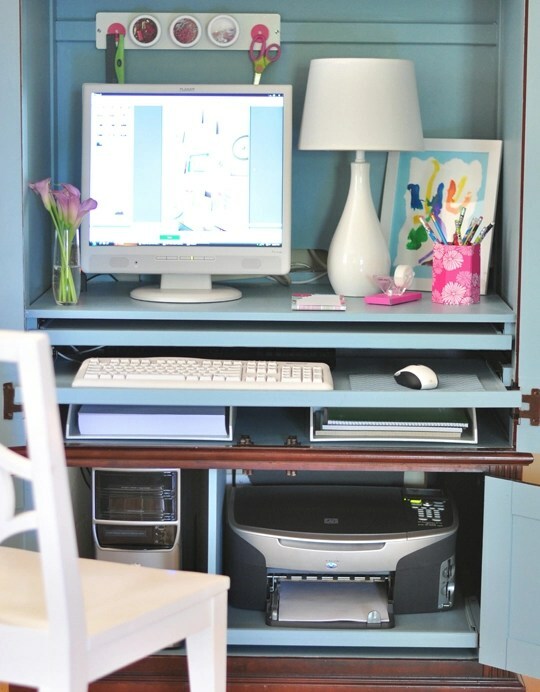 The workstation and printer hide down below, so convenient that they actually fit! 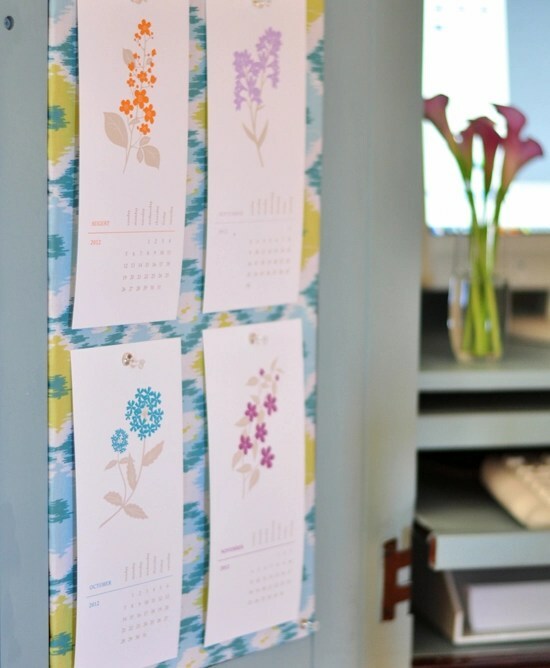 I made a fabric covered corkboard with the left side door for pinning calendars or other miscellaneous papers. To make it, 1. I used a package of cork tiles purchase at an office supply store and trimmed them to fit with a box cutter. 2. A basic stapler will affix the fabric to the cork. 3. 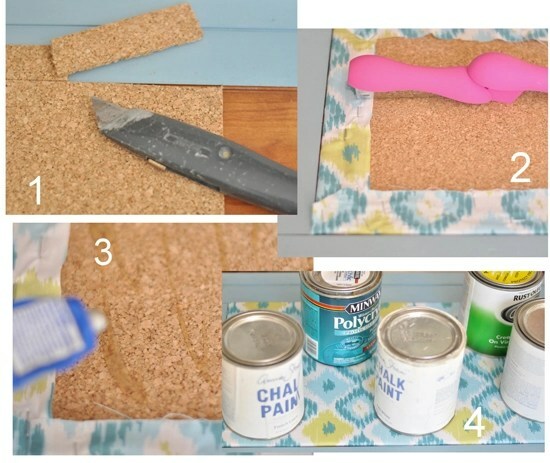 Use a strong glue designed for adhering multiple surfaces to secure the cork to the wood. 4. Paint cans weighed down the fabric covered cork to the door overnight for maximum adhesion. 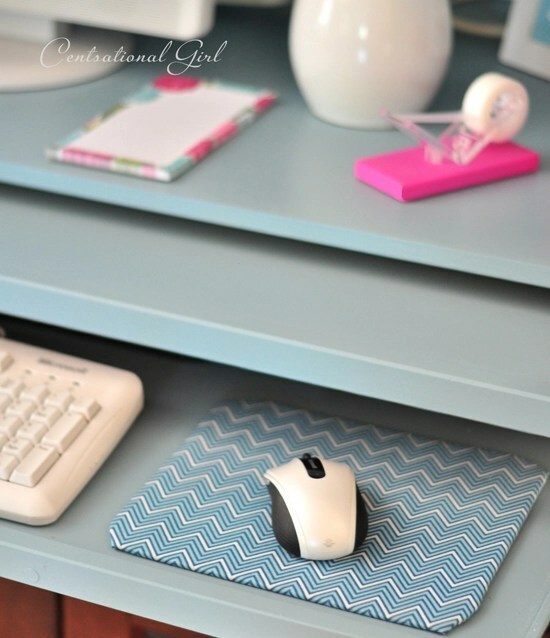 I also made a cute fabric covered mousepad with some scrap fabric, for the step-by-step follow this tutorial from a few years ago. A white keyboard helps keeps it light and bright! On the right side is a chalkboard for weekly reminders – oh yes you can make your own chalkboard paint which is what I did with some leftover paint from these bookshelves (closest color match is ‘Fiji’ by Benjamin Moore) and non-sanded grout. I kept the outside the dark stain because it sits on the edge of our family room and blends in better this way. The kitchen and family room are just to the right so I can keep an eye on kids and their homework when it’s open. All it needs now is my big binder I put together every school year with all the schedules, handouts, and miscellaneous papers. School starts Wednesday, so I’m ready! Fingers crossed I can keep it this organized when school is back in session. Sources: magnetic storage and hooks from The Container Store; calendar from Silhouette Blue; fabrics: Bohemian Ikat and Boho Chevron; paint color (closest match) ‘Boca Raton Blue’ by Benjamin Moore; monitor & keyboard: Planar & Microsoft; lamp from Target; white paper inbox trays by Martha Stewart for Staples; palm leaf panel from Z Gallerie; white chair from a thrift store. I totally need one of these for when the day comes that small children move into my office (which is inevitable and makes me so sad and so happy at the same time). Something like this is perfect for a main room in the house because you can close the doors and hide the mess! 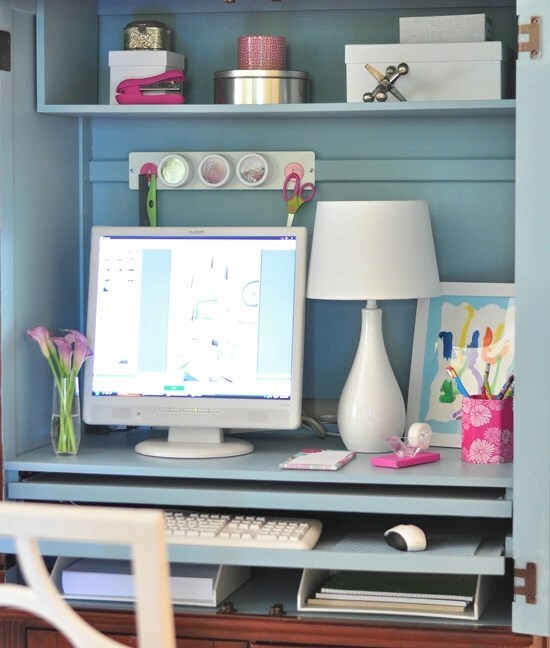 beautiful…and so much lighter and brighter with the blue paint…makes me wish I had an armoire to convert!!! The armoire looks great. 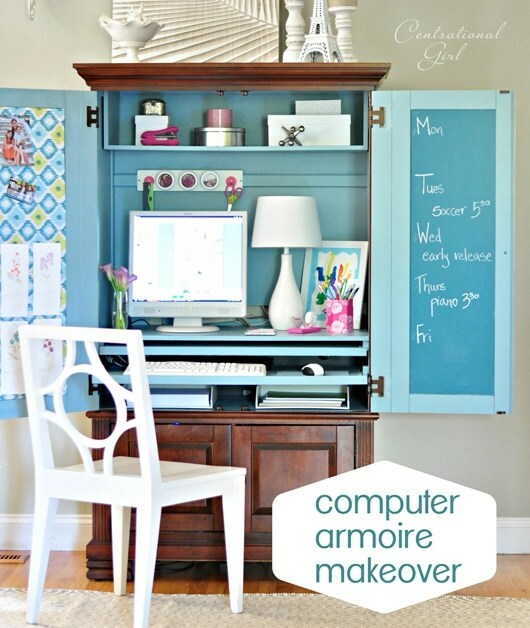 I’ve been thinking about back to school and how I can stay organized and how I happen to have an armoire very similar…time for me to mix up some paint. What a great idea. I love this look! The inside is so bright and pretty– such a contrast to how dark it was. I also would have never thought to use a lamp inside a piece like this. Thanks so much for sharing! Love this! Its really beautiful and functional. Great transformation! Such a beautiful idea, Kate. I love this! Hi Casey, good question! Not sure, let’s hope no issues! They’re a good 10 inches apart. Gorgeous! I love the bulletin board and chalkboard on the doors! Great makeover! Wow! This looks so inviting now. What a wonderful idea– I am so impressed, I too would love to start out the school year organized, It is difficult because we are remodeling a old house we bought last Oct. Thanks for the inspiration- I hope that my blog will bring such inspiring ideas to my blog friends– I think I will have to add your button to my blog-! THANKS Have a wonderful day – dawn is dreaming. Looks much brighter indeed. I wish your favorite color was not blue though! You are sure good with paint and making a dark and dated piece look bright and revived. Great post at a great time. We have a very similar situation that is not functioning well. I desperately need to do something to the interior to make it functional and pleasing. Hadn’t thought of just painting the interior. This is so terrific! I love the fabric covered cork to go with, and the chalk board as well. You are so inspiring! It’s so cheery! I am sure the kids are gonna love working there! 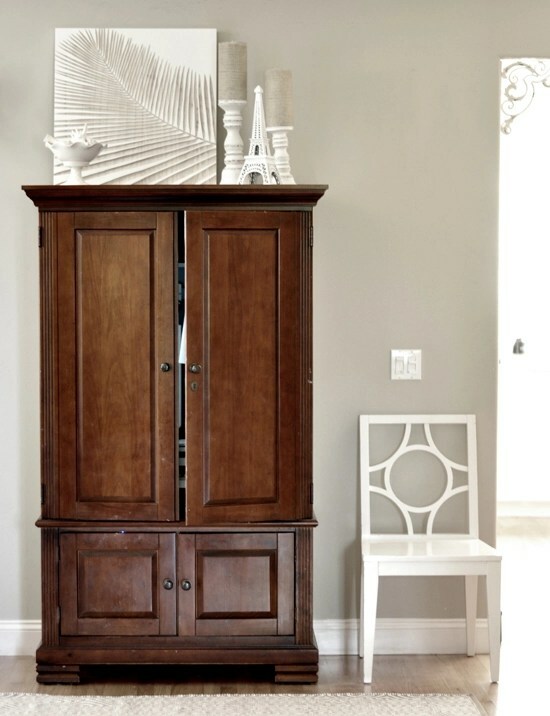 we have a similar cabinet but it’s a corner one, and we incorporated it into a new bathroom as a built-in linen closet! we nearly trashed it 100 times and i’m so glad we re-purposed it since it has been with us so long and now is a unique architectural feature. That’s a great update! I remember those cabinets from when I was in school. Brilliant color selection. This turned out fantastic – I have an armoire that I’ve been wanting to convert to a computer station for a while. This might give me the motivation I need to get started! Kate, seriously how DO you contain yourself? You are a genius!! Love it all so much. I really love the blue for the inside of the cabinet. What a cheery and useful piece you have created for your family. Your personalized touches really make it something special! LOVE! Can you tell me more about your binder for the school year? Just starting pre-school with my daughter and I’m terrified of the organization required based on everything I’ve read. That pop of color was a great idea! It makes the experience of sitting by the computer enjoyable and inviting!! Way to go!! That chair is a fabulous thrift store find!! It’s so pretty! I’d never know from the outside that you’d open the doors and find a cheerful work station waiting for you. It’s like Dorothy going into Oz. Or something. When replacing your light bulb, try an LED bulb. They are low wattage for the same amount of light and do not put off as much heat. We have converted almost 100% and they work great! Wow, it DOES look like you’re ready! The blue is really fun and I’m sure it will totally boost your mood whenever you sit down to get something done. Beautiful job! I love this! I’m sitting here looking at all my furniture that has deep dark shelves and thinking it all needs some updating! This turned out beautifully Kate! I love that shade of blue! So I want more info on the giant binder to organize back to school stuff. I am also setting goals to get more organized, so I would LOVE any tips you can pass on. Maybe a Back to School Link-up? Hey Chelsey, I make a Family binder every year with all the school contact lists, calendars, etc. Keeps me sane! So pretty. AND Functional .Love it! You did a fantastic job! What an improvement! I love that you kept the outside the original stain. Wow, that first shot looked right out of BH&G to me! Fantastic makeover, Kate. :) Love the beautiful gray-blue. Cool. 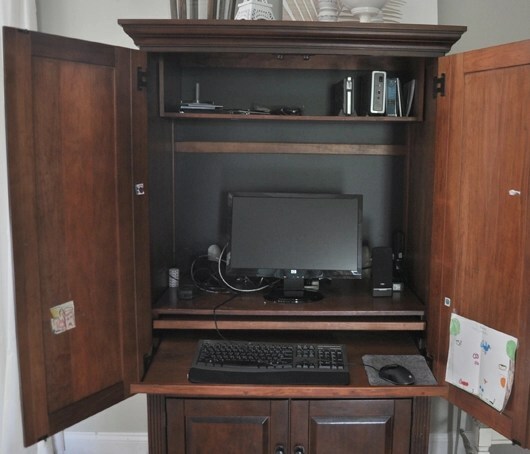 I always knew I didn’t want to use the similar computer armoire we own, and now I know why and how to remedy it. 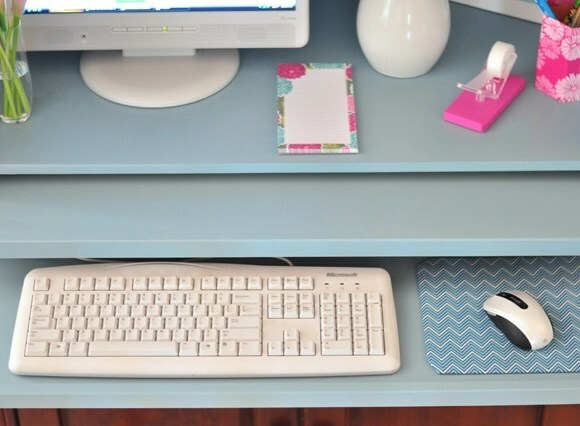 I’ll copy every one of your ideas — the painted interior, the corkboard, the chalkboard, and the mouse pad! I hate trying to get sticky oil paint off my skin, so I usually paint wearing cotton stretch, neoprene-palmed gloves. And as a professional painter, I keep a bottle of cheap, cocoa butter hand lotion in the work van. Using that with a clean rag gets hands cleaner than washing with soap and water. Thanks for another great tutorial. I know you’ll have an organized, happy school year with such an auspicious beginning. I love the blue interior! 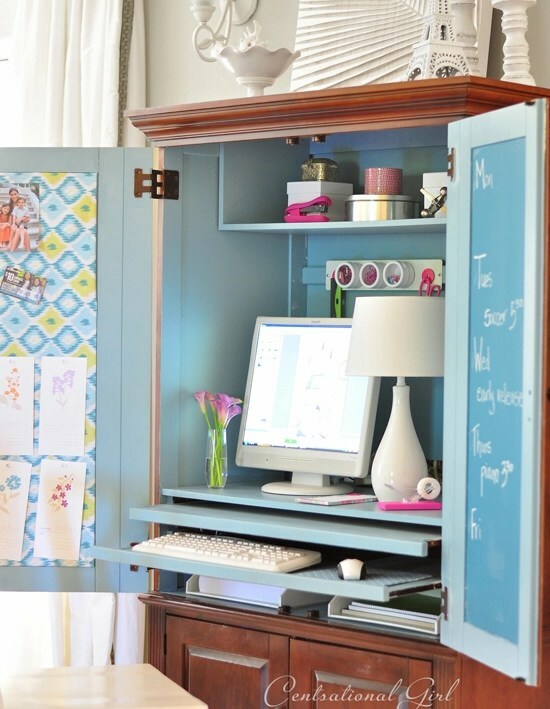 I have a similar armoire that used to house a tv….I turned into a computer armoire a couple years ago, with covered cork boards on the inside doors too, and my kids use this computer for all their school work. It’s worked great for us since we can close the doors and hide the mess when not in use! It’s beautiful Kate and such a cheery spot for the kids to do their homework. A great way to kick off the school year! ooo I love it! I love every re-purpose project you do! I also want to see what you do with the school binder! I won’t have a kid in school for a while, but I want to get ideas for how to keep our lives best organized when it does happen! Do you have a post on it already? If not, will you do one? Love it love it love it! I have been trying to get up the guts to paint my old computer desk too. Would that primer cover up the heavy wood grain on oak furniture? Thanks for the tip about the veggie oil! Amazing transformation – love the paint colour choice! I love this! I have a computer armoire in my living room that I use as a craft area but it’s dark as well so I don’t spend much time there. I should try doing this. You just inspired me to get my act together and get organized!! Love the colors you used! School started here yesterday and as I sit reading this I am facing our computer armoire. I had been thinking of getting rid of it, going to a desk, but after your ideas, I think I’ll keep it. I hadn’t thought of just painting the inside. Ours also is like a tomb inside and someone is always complaining about the iight from outside not reaching in (and that ity bity light built in doesn’t help!) Thanks for the ideas, always great. Kate, you are so great with repurposing furniture to have multiple uses and just brightening them up. Look forward to more info like this in future. That is so awesome! Love it! I am always confused about what kind of primer to use. Do you always use oil based primer on furniture? Also I have to paint over wall paper in my kitchen. We tried everything to get it off. IMPOSSIBLE! Should I use an oil based primer over the paper? Any tips would be greatly appreciated! Kate, that is gorgeous! I always get confused about what kind of primer to use. Do you always use an oil based primer on furniture? Also I will be painting over wall paper in my kitchen YUK! We have tried everything to get it off. Nothing has worked. Should I use an oil based primer over the wallpaper? Any tips would be greatly appreciated. Thanks Kate!! 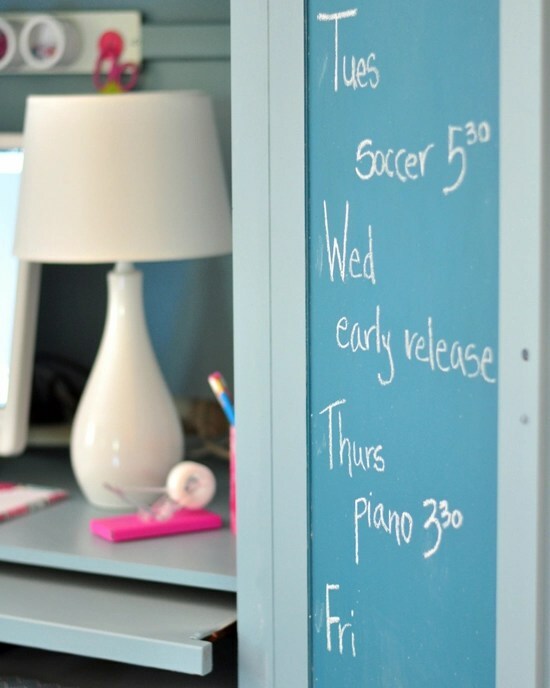 So many great ideas!I had no idea that you can make your own chalkboard paint. 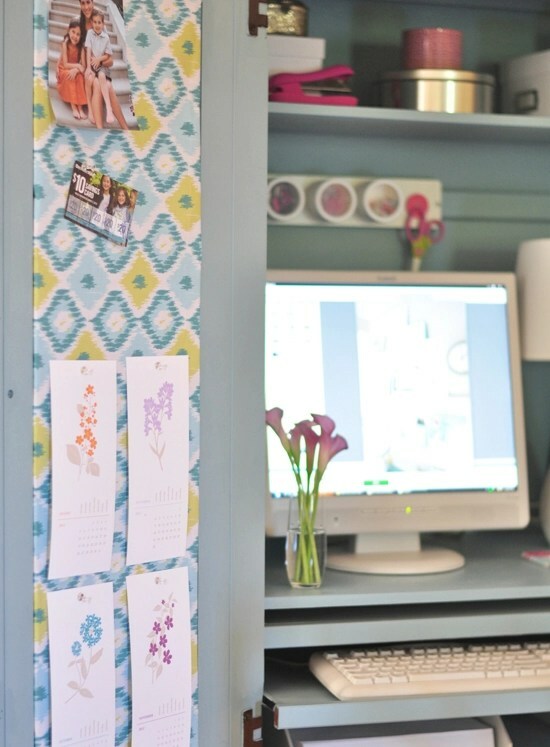 I also love how you made the fabric covered cork board! I was wondering if the armoir is real wood or a vaneer. Do you have any hints or tutorials about painting over vaneer? I’ve got a computer desk that needs some serious help. Hi Jessica, it’s real wood but with veneer or laminate, use a bonding adhesion primer, the Zinsser Cover Stain will work for glossy surfaces. Love it! I wouldn’t mind working in that space. 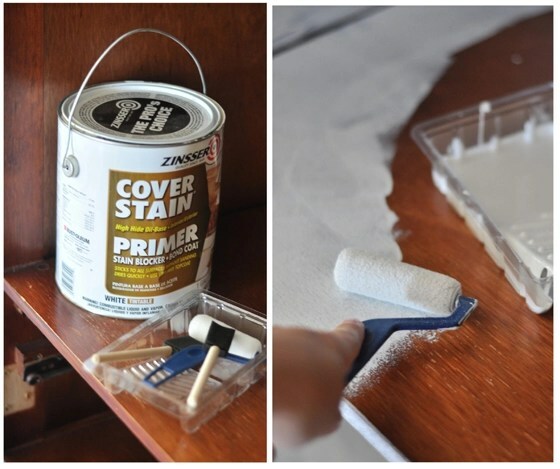 Great tips on the paint removal. I’m definitely going to try that. Great color choice! I love it. I like that you can tuck everything away after so technology doesn’t takeover the living room. Great work! I love how cheery this looks! We’re not expecting our first baby until December so I have a few years until school hits but…. I can absolutely use the chalkboard paint idea now! Thank you, thank you for the tip on cleaning off oil paints! How do you clean your brushes successfully? I throw too many away when using oil based paints. Thank you! Hi Sonya, I try to avoid using my nice brushes with oil based primer – I usually stick to toss away rollers these days! With brushes, you still need to use paint thinner or mineral spirits to remove all the paint from the fibers. Wonderful makeover! Love the paint color! 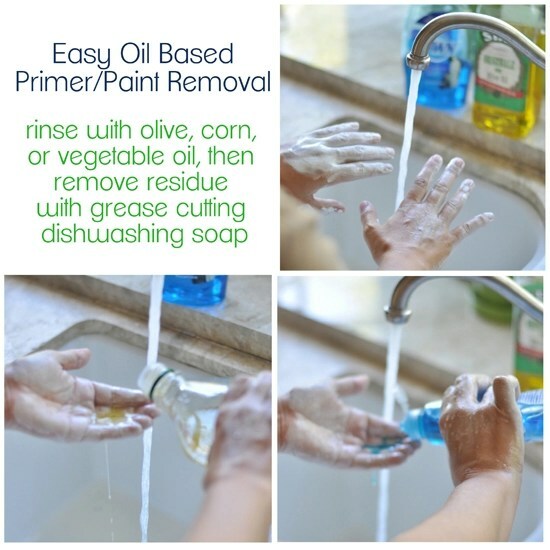 Yep Robin, that simple trick makes working with oil based products much less agonizing! Wow. Wishing the only armoire I own was not in my room. Really great idea. I am on board with getting as organized as possible this year as well. It seems as though once school starts, there is no slowing down to do so! I better get on it. Hi Linda, you will love a brighter interior, even in the evening it’s much more pleasant! Love it! When did you get the target lamp? I’ve been looking for a lamp like that and am having a very hard time finding one under $100. Looked at both my targets and nothing! Thank you! Hi Nicole, I bought it last year, it used to sit in the kids play space, wish they still had it! Hi Kate! Love your organization! I know it isn’t home related, but I woud love to see a post on your binder for school stuff. My kids are similar ages and that sounds so smart! I am pretty sure this is one of my favorite posts of yours yet. The whole thing turned out wonderful, I adore that pop of fresh color inside, but yet the integrity of the original piece remains on the outside. So great! And all of your lovely accessories and colors are incredible, fab organizing to boot ;) I am always so inspired after hanging out here for a couple of minutes! Wow Jen, thanks so much! This is so cute! For the longest time it never occurred to me to paint furniture. It always just seemed like, it came like this.. there is no changing it. Reading your blog along with others has really taught me how to re-purpose things and give older things much needed facelifts. I even feel compelled to buy things brand new, as I once did! Can I ask you how the paint has held up on the shelf with the keyboard? I’ve painted a lot of furniture and I want to paint a computer armoire at our cottage. Was just worried about how that would hold up. also the area that the monitor sits on? What type of paint did you use for your main paint? Thank you. Very well, still looks great!